30% deposit as booking confirmation, and balance on departure. Situated at only one km from Porta a Selci and the Etruscan Museum, this Hostel is situated in a quiet position, far from the city chaos and traffic, with the possibility to park the car free of charge. From her you can reach the most important cultural cities as Florence, Pisa, Lucca, Siena, San Gimignano and the seaside. 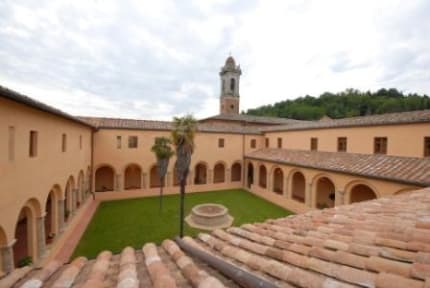 Without structural barriers, this facility is well characterized by the internal marvelous cloister surrounded at the four sides by an open gallery, built respecting the drawing of Michelozzo (sculptor and architect in Donatellos laboratory), where you can sit and enjoy the peaceful atmosphere of the ancient Franciscan Convent, just a good stop. We offer a small caffetteria, a tv corner and a reading room, a wi-fi connection is free of charge, but also a beautiful frescoed hall, where breakfast is generally served. By reservation it is also available for dinners, brunches, business meetings, ceremonies and parties. And for our younger guests, we have a play area, interior, where they can spend some time in the heat of summer and get to know with other children. At the back of the Chiosco there is a wide free parking available for all our guests and free of charge. Check in: from 15:00 until 20:00; For different check-in time, please contact us: we will do the best to help you!